Last week had several highlights. I cleverly used the 15-minute relaxation session at yoga to have a power snooze. Then changed into a pale gold top and dashed to the first Christmas party of the season. Sailing proudly past the other 10 awestruck dumbfounded pregnant women. Then came the office Christmas party. Where I tried to blend into a room full of gorgeous, small-waisted colleagues. Three layers of makeup and an off-the-shoulder maternity party frock later my boss declared I had “just” maintained the glamour stakes. But the biggest highlight of it all was meeting at least four different couples who wanted to cook a curry at Christmas. Not in place of the big bronze bird with all the trimmings.Â But for pre-and post-dinners with friends and family. I could barely conceal my excitement as I tried to rack my brains for simple curry recipes that wouldn’t send them into a blind ingredient-sourcing panic in the run up to the big event. I needed a chicken, lamb and vegetarian option. Crowd pleasing, one-pot meals that can be cooked easily and in large quantities to feed hungry families. My next few posts are dedicated to this theme. 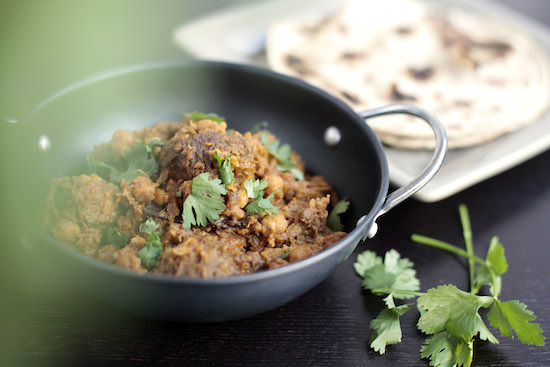 The first recipe is for Dal Gosht, spiced lamb cooked with lentils. An Indian Cassoulet of sorts. I last made this in a large stock pot, divided it in half and froze it. Later serving it to two small groups of dinner party guests. Both were well impressed. It’s tasty without being mouth-numbingly hot and a real winter warmer. From one big bronze bird to another – this is my spice-filled contribution to your Christmas meal. Wash the dal in a sieve under the tap until the cold water runs clear. In a large pot, set it to boil with half a teaspoon of turmeric powder. In the meantime, slice the tomatoes and the onion and puree or chop the ginger and garlic finely. Bring the oil to heat over a high flame in a medium pot. When it’s hot, throw in the whole spices and as they sizzle up, mix in the onions, ginger and garlic. Fry the ingredients until they take on a pale golden colour. Now mix in the tomatoes with the spice powders and stir viciously for five minutes until the masalas are cooked. If they start sticking to the bottom of the pot just add a little hot water and scrape them off. Then add in the lamb and brown it in the masalas. Make sure you keep an eye on the lentils. If they are dry, add a cup of hot water. When the lamb is brown, add a cup of hot water to it, cover and cook a medium flame for half an hour. Finally, uncover the lamb and mix it into the lentils. Cook the two together until the lamb is tender and the channa dal just melts in the mouth. This dish is lovely sprinkled with fresh coriander and served with Jeera Pulao. But if you fancy making an extra effort, I would recommend some home made naan to go with it. Looks gorgeous. Have not tried the Dal Gosht yet or don’t remember tasting it either. How would goat work inplace of lamb? Surely Naan bread from Tesco would suffice? Never tried dal gosht before Mallika…but am still dreaming of the delicous pepper lamb we had yesterday! Thanks for the recipe; cant wait to see what follows next! Another fabulous looking recipe! Have you heard of this spice blend called vadouvan? All the descriptions I’ve read of it say its from Pondicherry, which is my home town, but I’ve never heard of this spice blend. It is reminiscent of something called vadaam, which people use in sambars etc. Anyway, just wanted to pick your brain– you’re Miss Masala, after all! Thanks! That sounds so good Mallika! I could eat it RIGHT NOW!!! Indosungod – Goat would work really, really well. Greg – I make peshawari naan, especially for you! Thanks Jenn. It’s hard to be fabulous without the copious drinking though! This sounds delicious! Can’t wait to see the chicken and vegetarian versions, too! (Can you tell? We’re expecting LOTS of house-guests — one pot meals are God’s gift to busy hostesses). Snoozing during yoga – that made me laugh (in recognition). What synchronicity was afoot for fate to take you in the path of four curry-making couples?! Those moments make me think of the “hidden stream underlying everything”. Thank you for this recipe and for thinking of limiting sourcing-panic. I do not eat tomatoes (allergy) but I guess you could just use, say, 2 extra tablespoons of water?